This native of India has adapted well to Texas, Escondido Ranch has one of the finest herds in the state. 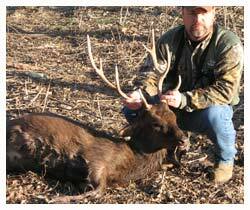 Each year we have many bucks harvested by our hunters with antlers having 30" to 36" of main beam. 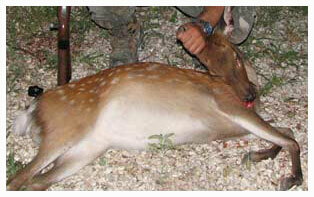 Axis does are popular with our hunters as their venison is delicious, and their hides are colorful. 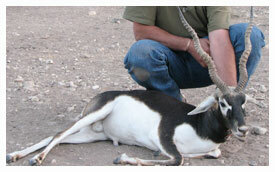 This native of the deserts of North Africa has adapted well to the Texas Hill Country. Both male and female of the species can grow large, backward sweeping horns. 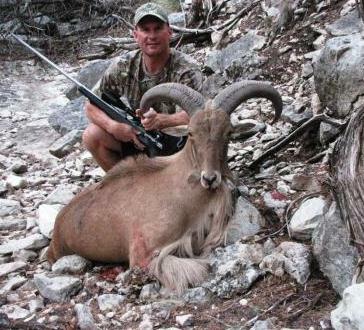 The male trophy aoudad, however, carry thicker horns of up to 30 inches, sport a heavier mane of long soft hair along their throat, chest and front legs and can weigh in excess of 300 pounds. 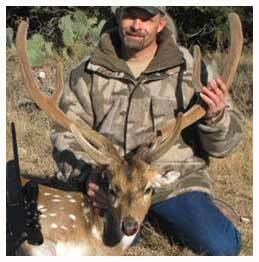 This North American native has done well on Escondido Ranch with trophies having 6 to 7 points on each beam. 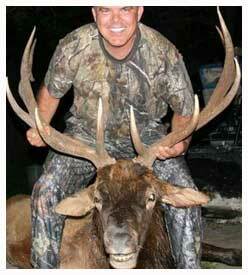 Each year we have reasonably priced cow hunts for those who are hunting only for meat. This native of India is thriving on Escondido Ranch. Each mature male spends his time herding and protecting his group of females from the advances of other males. Trophy quality males will have greater than three and one half spirals. Their venison is excellent! This native of Japan obtains 8 points when mature and has a dark brown coat. Our hunters have taken several gold medal bucks. This native of Europe is popular with our hunters due to it's high quality venision and the beautiful skins which can be tanned. The scimitar oryx once inhabited grassy steppes, semideserts and deserts in a narrow strip of central north Africa. Since last century, scimiter has successfully adapted to the plateaus of South Central Texas. 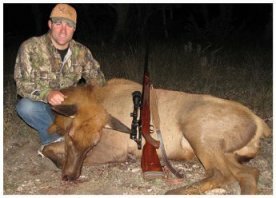 For the quality and abundance of meat, few North American animals can compare to Elk Cow. As cautious as a Bull Elk, these illusive and prized animals can be a real challenge to track down in the canyons and valleys of the ranch. 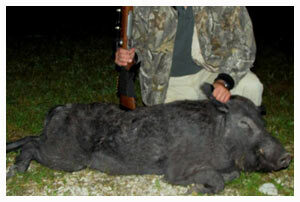 Next to the Whitetail Deer, the Feral Hog is one of the most common game animals in Texas. The sows are able to have multiple litters throughout the year that may range from 8 to 20 piglets. Hogs are one of the most intelligent and challenging animals to hunt. The exotic doe hunts combine the excitement of an affordable hunt with the benefit of filling a freezer with delicious venison. 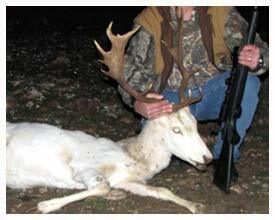 Many of these hunts are also donated to Texas Youth Hunts and charity hunts.